Hospital flooring has arguably one of the hardest roles to play: it must not only provide a suitable surface for doctors, nurses and other staff to move around safely and quickly over the course of long shifts, but also meet the needs of visiting members of the public and people who are in poor health. 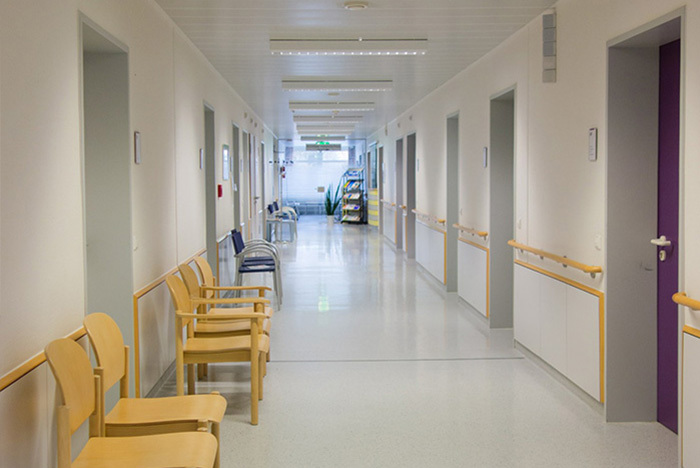 A hard wearing, easy to clean and hygienic flooring solution is obviously key for hospital environments. Aside from all of the human elements – including staff, patients and visiting family and friends – there are practical concerns like hygiene and drainage in wet rooms to take into account. Resin industrial flooring offers a wide range of qualities to cope with all of these different demands, with a high quality general finish that is hard wearing and easy to keep clean. Special primer layers and surface finishes can protect against damp and spills, or add texture for extra grip where necessary; and poured resin can be used on slopes for a seamless finish, not just on the flat. Durable, hygienic and easy to clean resin can be used throughout the hospital, inside and out. Seamless top surface means no awkward bumps and ridges for wheelchairs to roll over. Primers and surface finishes add resistance to damp, oil and other spills, or extra grip. Epoxy paints can be used to add line markings and lettering to identify room and ward numbers. The expert team at Thelwell Flooring can help you to decide exactly what combination of primers, epoxy paints and aggregate additives you need for a hospital floor that can take whatever you throw at it. We carry out detailed preparation to expose the existing surface and to make sure the poured resin adheres well to it, which helps the surface to remain in as-new condition for longer. Colours, graphics and lettering can be incorporated into the floor itself, or added with epoxy paints once it has been poured. The resin sets quickly and seamlessly, so you can start using the new floor as soon as possible – crucial in hospital buildings that cannot be fully closed down during refurbishment work.